Wow a great and reliable !! I have used this before on myself and on my family. 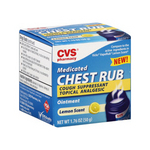 Its really great at relieving congestion and coughing. I use this any time ANYONE in my family gets sick, it is my go to for EVERYONE! I use the product for my kids every time they come down with a cold. It knocks it out and brings their coughing down tremendously. Use for chest congestion, sore throat, ear ache, sore joints, keep mosquitoes away, stuffy nose, pimples, can't say enough good things about this product thank you. I have used this product since I was little. When I get a cold, I get it BAD. My Mom used to put Vick's on a washcloth, tie it up, and have me sniff it and keep it by my nose on my pillow to help my congestion. I love the smell and it works well! Love the smell and how it helps me breath! So I have never used this product before but as a child my mother would always get something similar and it seemed to work well enough. Fast forward to about a week ago with the weather changes I tend to get sick a lot. This time i had a stuffy nose with a mild cough. As I went to the store I noticed this little gem and decided to give it a shot. The price was alright considering how much came in the container. For me it was a little under five bucks for about a two ounce container. The smell is very strong and initially it was somewhat discomforting. Its is best described as that strong icy mint smell from a fresh stick of gum. I applied it the same way my mother use to apply the other brand which was smearing it under the nose and rubbing some in on the chest area. I don't recommend using too much. I found that a little goes a long way with this product. It does give off a tingly sensation but it is not enough to irritate. As I said before the smell is very strong but found that it made me use my nose more than I would have had I not used the product. When my nose is stuffy I tend to breathe out of my mouth more. Overall I liked the product it was simple to use and took care of my stuffy nose after about two days. This is while applying it two times a day when I woke up the third day I felt fine and so I didn't use it. I liked that it was to be used externally as I the coatings fro most pills upsets my stomach and liquid cold medicines have horrible tastes. I will definitely be using this product again. 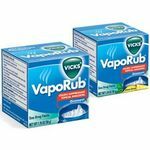 My Mom used Vicks Vapo Rub on me, I used it on my children and now my Grandchildren. Obiviously since its still being produced speaks volumes .Wherever I get night congestion I just rub some on my throat, chest nd under my nose, I feel immediate relief it opens my airways and helps me breathe.